This is my latest style of nuno felted scarf. I call it the "Lightning" series of scarves because of the white linen fibers randomly scattered over the surface. 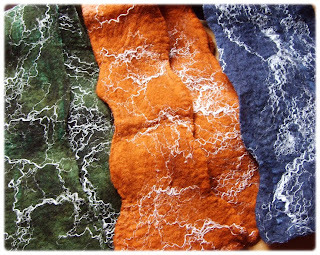 Each one of these is created individually through nuno felting techniques where wool is combined with a silk base. Then I hand dye them to get the richest colors possible. These particular scarves will eventually be going to Eclectics Gallery here in Kansas City. If you live in the area, please stop by in a few weeks to see them in person. The photos don't quite do them justice because you can't feel how super soft and lightweight they are.